The importance and value of #networking has remained a constant throughout the years. What has changed dramatically, however, are the tools and resources available to help students, employees, and entrepreneurs network faster and with greater impact. We’re talking social media here. Besser Company entered the wide world of social media in 2013 and has experienced a steady growth of followers ever since. The ability to connect with customers, employees, industry associates, and community members was a communication game changer for us. The ability to spread our messages across the globe with a single click has proven to be extremely powerful. 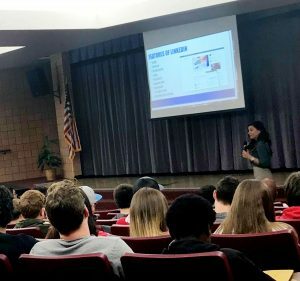 Understanding the importance of networking and connecting, the Alpena High School hosted a half day seminar for its marketing and business students at the Alpena Community College designed to replicate a marketing conference they might attend in their future professional life. Speakers from around the community were asked to make short presentation to the group of 140+ students on topics ranging from networking, social media, etiquette, social skills, ethics in business, finance, etc. Breakout sessions were also scheduled, allowing students to choose a topic of their own interest and local businesses were also on-site with small vendor displays. Candie Dombroski, Besser Company’s Corporate Communications Manager, was invited to attend the event to speak to the value of LinkedIn’s networking power. “I commend the teachers and staff who helped to put this event together. It’s important for students to start mapping out a strategy for how they can achieve their professional goals. LinkedIn is an excellent resource to help them do so.” Candie currently manages the company’s LinkedIn, Facebook, Twitter, and Instagram pages. Be sure to follow us on social media to stay current with company news – we look forward to connecting with you!